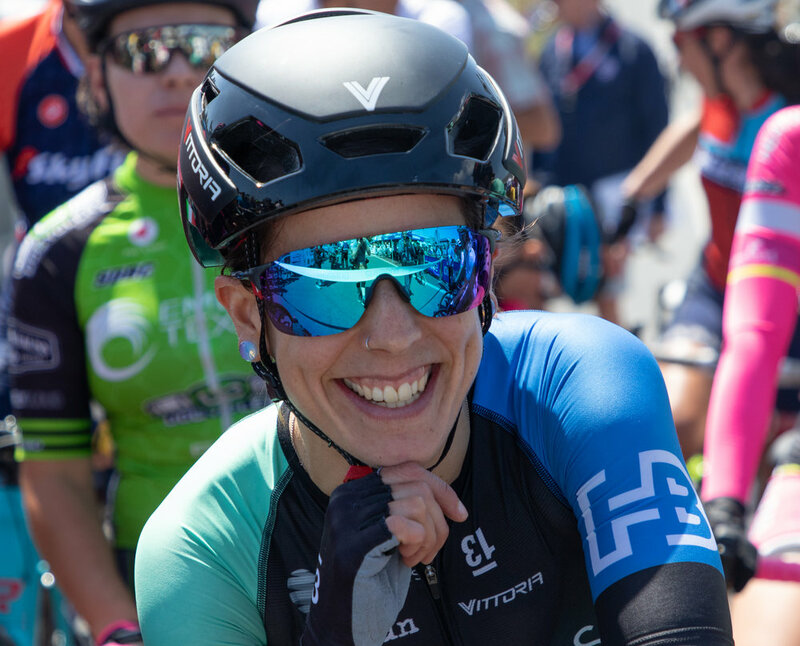 Starla, a Portland-based rider returning to the team for her thirdseason, is known for her sprint, aggressive racing style, and dedication to her teammates. She strongly believes in lifting up women in sport. Being an athlete is hard enough, and she feels that women can do so much to elevate the sport when we work together. Off the bike, she is a graphic designer (she designed our 2019 team kits! ), wife, dog mama to Abi the Aussie, and lover of outdoor adventure - be it trail running with Abi or overlanding deep in the backcountry with her husband Gino. She loves to explore, appreciate the beauty of nature, and live in the moment. Specialty: Breakaways, lead-outs, sprinting, giving my all for my teammates. Best Moment in Your Cycling Career: Racing towards the finish line on the final stage of Redlands cycling classic and having the moto official tell me "you will win the Red Jersey for the climber's competition, you just have to finish". Getting to take that win home for the team was a huge highlight of my career. Race Day Rituals: Wake up and drink coffee, but I guess that’s every day. Favorite Race: Hard to pick just one! Redlands, Delta Road Race, Philly Cycling Classic, Winston Salem Road Race, San Rafael Twilight, Gila. Goals for 2019: Win some races, help teammates win some more, and inspire others to pursue sport. Favorite Non-Cycling Activity: Overlanding and camping with my husband and our dogs Abi and Angus. Biggest Fear: Not fulfilling my athletic potential. Must-Haves for Traveling: Travel coffee set and coffee.